The announcement of Windows Phone 8 indicated Microsoft's attempt to rebuild its brand value in the mobile world dominated by iOS and Android. Finally, Microsoft made it, most notable with respect to the achievement in watching HD video on WP8. 1. Windows Phone 8 allows mobile phones with larger screens. Here take Nokia Lumia 920 as an example. It is armed with a 4.5-inch display, which cannot be too good to enjoy movies and videos thereon. 2. Microsoft’s WP8 now supports 1280x720 and 1280x768 resolutions, in addition to the base 800x480 resolution already available on WP 7. Like the 4.3-inch HTC Windows Phone 8X, it touts a resolution of 1,280*720, giving us a fabulous HD video watching experience with crisp image. 3. The support of multi-core CPUs of up to 64 cores also allows us play HD videos on WP8 at a much higher clock-rate with less energy. 4. The improved support for removable storage is excellent for people who want to have more HD videos such as MKV and M2TS files on the WP8 since there is a larger space to save these videos. Despite Windows Phone 8 has great capacity to play HD video files, it could not break free from format restriction. So to play MKV M2TS on Windows Phone 8 without limitation, you have first convert MKV M2TS to WP8 compatible format beforehand. To get HD videos AVCHD, QT HD, M2TS and MKV to WP8, you need to prepare a professional video processing program, such as MacX Video Converter Pro. This software can convert MKV to WP8, M2TS to WP8 on macOS (Mojave included) at 5X faster speed and original quality, so that you can play MKV M2TS on Nokia Lumia 920, Samsung Ativs S and HTC Window Phone 8 X, etc. wherever you go. Before you transfer MKV M2TS video to WP8, you have to download, install and run this HD video converter for WP8 on Mac first. For Windows users, head over to HD video converter for Windows on PC. Import M2TS or MKV source video by clicking "Add File" button. You can also add more than one video files at one time. Choose the output format as you like. To convert MKV M2TS to WP8 on Mac, simply hit Microsoft Device -> to Microsoft WP8 Mobile and choose the specific mobile phone like Samsung Galaxy S9/Note 8, HTC 10, Android iOS iPhone X, etc. or the general WP8 Video as you expect. You are also allowed to encode HD video to WP8 from Asus, Samsung, Acer, Huawei, etc. Tips: this tool supports merging two or more MKV/M2TS HD video files at a time. You can simply choose the status Merge All "On" for merge in the main interface. 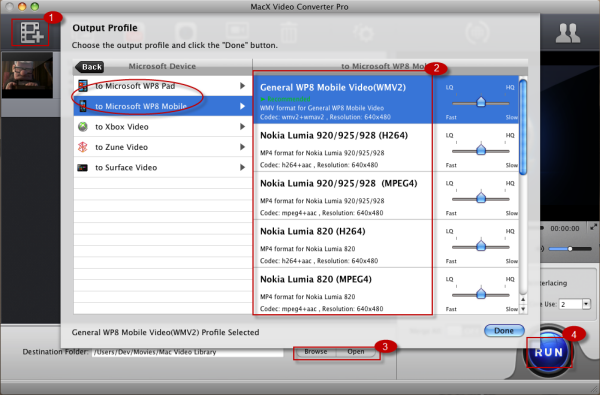 Hit the "RUN" button to start converting MKV M2TS video to WP8 on Mac OS. Besides finishing AVCHD MKV M2TS to WP8 conversion within four clicks, this video transcoder for Mac also manages to convert among a myriad of video formats, like MKV to AVI, M2TS to MP4 or MTS to MOV, WMV to MOV, FLV to AVI, etc. You are also empowered to convert HD videos like AVCHD, M2TS and MKV to iPhone, iPad, HTC, Samsung, PSP, Surface, Kindle Fire, etc with the assistance of this HD to WP8 decoder for Mac. 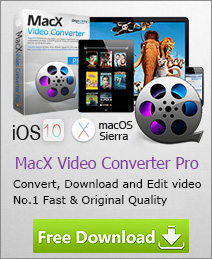 Here is a list of the top free Mac video converter for you to transcode among HD and SD videos on Mac OS, like MKV to AVI, M2TS to MP4, WMV to MOV, etc; and encode video to iPhone, iPad, Android. So do not miss this to change video free. This guide introduces a Mac free mobile phone video processing tool that makes it simple to convert SD video MP4 FLV AVI, etc and HD video like AVCHD, MTS, M2TS, MKV for playback on mobile phones such as Android, Blackberry, Nokia, etc. This tutorial shows the detail information about how to add MKV to Android video format, so that users can play MKV files on Android phone like HTC, Samsung, etc. at will.